Build products people really want! We enable startups to build better products. First know the pain of your customers! Find out what they really need! Drop a line or give us a call! KYCB - Know your clients better! KYCB is a customer development agency from Berlin. Respect: Constantly solving a problem for your target customers will gain you respect. We tell you exactly what those problems are. Love: If you want your customers to love you and your product you need intimacy and a certain amount of seduction. We can tell you why customers do what they do and what kind of emotions they want to have. Lovemark: Gaining love and respect will create a brand people really want. KYCB is the first agency that does customer development and branding at the same time. We tell you which problem to solve and which emotions to trigger. Funding: Impress your potential investors with deep market knowledge. Minimum Viable Product: Know how to delight your early adoptors with the right feature that your competition does not have. Product Market Fit: Focus on your target customer's most important problem and win the niche with low budgets before you scale. Revenue: Creating value is the only way to survive in the long run. Know your clients and create a maximum value for them. Scale: Have a clear definition of your customers and your brand and you will not loose focus while onboarding, expanding your team, and further develop your product. Value Creation: In the long run you can only survive and stay ahead of your competition when you know your clients better then they. Dual-Agile Process: This is a process of simultaneus discovery and development that we like to implement into your organization. This will perpetuate your innovative engine and your capabilty to delight the customer over and over again. UX/UI: is just the tip of the iceberg of discovery. We will let you dive deeper into new needs, new features, new nuances of what you mean to your customers. We are the first agency that integrates customer developement and branding, because each product has two aspects: a problem to be solved and a brand that triggers emotions and meaning. The art of finding a problem worth solving. The art of adding meaning to a product. Product, people really need and want. groups of target customers by their mindset, and problem relevance. For each group we define a persona that represents the group. Here we want to know more about the emotions that the different target groups have. What is their what stories do they want to tell about themselves? What does the product mean to them? For each group we create a moodboard in addition to the persona. Today we know that we decide by emotions. We buy or download or use products because we have or want to have certain emotions. Markets are naturally devided by emotions. We look at the competition and find the right emotional position for your brand. that is not yet satisfactorily served in the market. Now we are ready to define the value proposition: which needs are we going to adress? What are the must have benefits, where do we compete with the market? How can we delight the target customer group we chose? 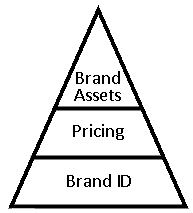 The Brand ID is your brand on 1 page. It assures that everything you build and send out contains one coherent message that adresses appropriate emotions. We establish values and why to connect more than just because it solves a problem. In addition to the features we set up a price according to the brands meaning, position, and value created in comparison to other solutions. We test pricing in interviews and prototyps. 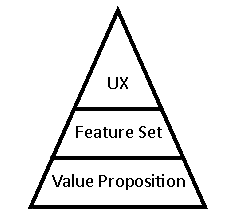 From the value proposition we derive the feature set. A first MVP needs the must haves to enter the market and one feature that solves the pain point of your early adopters better than all competitors. Later you want to add more to be interesting to other customers. The user experience completes the product and is designed after we know the feature set according to the needs we decided to serve. All that we do, everything that people connect with us must be designed according to our Brand ID in order to sent a coherent message to the noisy world around us. underserved needs and underserved emotions! Product market fit is when your customers don't want to miss your product anymore. We make them love and respect your product by finding the right problem to solve and giving them the meaning and emotions they want to have. the right solution for each stage. Only they can take you to the next level. Don't waste time and money on guessing ! We validate your idea professionally and show you relevant potential. We make you MVP ready. Don't jump to the product, keep testing with minimal effort! We test your idea with low and high fidelity prototypes and set up a landing page to test different headlines, call to actions and traction channels. You have a product but struggle to reach sufficient retention? Don't scale before your product fits the market! We go down both the customer development pyramid and the branding pyramid (see avove) testing and improving each level until we find a break through. Break through news to your investors. You are building, improving or start to build your product? Don't loose your focus by guessing about what your clients want! We help you to build each features according to your clients needs and adjust your brand to the meaning your clients seek. You have traction and want to stay ahaed of your competition? Don't just guess your way to new feautures and hope for success. We implement a dual-agile process of discovery and development into your organization that allows you to build features that constantly wow your customers. Get your customized offer now! my name is Volker. I am an anthropologist, sociologist, and cultural scientist. Knowing culture and society is my business. I am a management consultant for many years and a startup entrepreneur myself. It's my passion to understand what drives human behavior. I founded kycb because I believe it's time to build products smarter.